The lowly lentil is a pantry staple and a real star on the health front; knowing how to cook lentils will make your soups, salads, and side dishes all the more healthy and delicious. And they cook in just 20 minutes! There is much to love about the lentil. It’s inexpensive, sustainable, easy to cook, and so, so, good for you. I keep several jars of different varieties of lentils in my pantry and add them to soups, stews, salads, or just eat them plain as a side dish. They don’t need much, either! Just a little water and about 15 minutes. You can cook up a big pot of lentils for soup, or make an elegant, savory lentil salad for lunch. I bet you’ll fall in love with their earthy, nutty flavor. Need to make a lentil side dish for twenty for under five dollars? Click and slide the number next to “servings” on the recipe card below to adjust the ingredients to match how many you’re feeding—the recipe does the math for you, it’s that easy. Lentils are something in the pulse family: the dry, edible seeds of plants. It’s a category of superfoods that includes other legumes like chickpeas, lentils, dry peas, and beans. Lentils are the smallest and quickest cooking of all the pulses, which is good news for healthy weeknight meals and busy cooks. How lentils grow is pretty interesting. Lentil plants are short, bushy plants with pods containing one to three lentils in each pod. Canada is the world’s leading producer of lentils— there are over 5,000 active lentil farmers in Canada. It’s a pretty fast growing crop, too; lentils are usually planted in May and harvested in August. Growing lentils restores a lot of nutrients back to the soil, and delivers a lot of nutrients to us, too. Be sure to always sort through your lentils before you cook them to pick out any stones that may have gotten mixed in! No matter what color you choose, it’s hard to find a healthier, more nutritious legume. Lentils are low in calories, rich in iron, potassium, and folate, and an excellent source of protein. They pack health-promoting polyphenols and may reduce several heart disease risk factors. A half cup of dry split red lentils has more potassium than a large banana. Lentils contain virtually no fat and are naturally high in fiber, too. As a result, eating lentils is recommended if you’d like to lose weight. Are lentils carbs? Are lentils protein? Yes and yes! They do provide a healthy dose of complex carbohydrates, as well as protein. I think it’s perfectly okay to eat beans and lentils, if you enjoy them, and not worry too much about the finer points. Lentils do not contain gluten; in fact, lentil flour is a common gluten-free substitute for flour. Anyone who needs or wishes to eat a fully gluten-free diet can be confident that lentils – red, green and brown varieties alike – are fine to eat. However, the lentils you buy may be processed in a facility where wheat or soy are also processed, so I would always check the packaging for a “gluten-free” label, just to be on the safe side. No need to soak lentils. Contrary to popular belief, you don’t have to soak lentils before you cook them. They cook quickly no matter what. Lentils cook with a 3:1 ratio of liquid to lentils. No matter what lentil you’re cooking, just add three times the amount of water or stock. Add aromatics: A really nice way to add an extra layer of flavor to the lentils is by cooking them with aromatics. Think about what you’ll be using the lentils for, and consider making a complimentary bouquet garni, filled with herbs, peppercorns, and some leafy celery greens. Add a couple cloves of garlic, a bay leaf, carrot, lemon peel, or an onion. The aromatics will infuse your lentils with tremendous flavor as they cook. Some cooks swear by cooking lentils with a fresh turnip in the water, as well as a whole onion studded with a few cloves. The turnip and clove work magic on lentils! You can also cook your lentils in vegetable stock, chicken broth, or beef broth instead of water. Finally, don’t salt until the lentils are cooked. Like beans, salting can toughen the outer skins of the legumes and make them tough. Flavor the cooking liquid all you want, but keep the salt away until they’re finished cooking. Above all, I love cooking lentils because of their speedy cooking time. Can you cook lentils in an Instant Pot? You can, if you’re busy and don’t want to watch the stove. They take about as long or longer in the Instant Pot, including warm-up, cooking, depressurizing, and venting. Can you cook lentils in slow cooker? Yes! Place the lentils, water, and any aromatics such as onion, carrot, garlic, or bay leaf, in the crock of a large slow cooker. Cook on low for 8 to 10 hours, until the lentils are tender. Season to taste. Packaged lentils (dry or canned) keep easily on your cupboard shelf or pantry in a dry, dark, cool location for up to one year. If you purchase lentils in bulk or have open packages, transfer them to an airtight container. Cooked lentils and prepared lentil purée freezes well and is best used within three months, or refrigerated for one week. Be sure to store in airtight containers or plastic freezer bags. 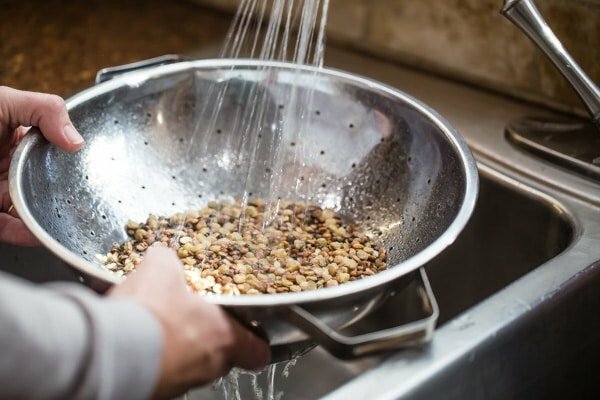 Rinse lentils in cold tap water to remove any dust or debris. Add lentils and water to a saucepan and bring to a boil. Cover, and simmer until tender, about 20 minutes. Do not salt lentils until they’re finished cooking. Drain well. Season to taste with salt and pepper if desired. Lentils do not need soaking, unlike other legumes. 1 cup dried lentils yields approximately 2 1/2 cups lentils, cooked.